Native to South America. Widely naturalized in Europe, South Africa, North America, Australia, Japan, New Zealand, Papua New Guinea, and other regions. Naturalized in 27 counties in California, the region of interest. Also naturalized in New South Wales and Victoria in Australia in areas that match California's climate. Other areas with a climate match: South Africa, a few of the US East coast occurrences, areas of Spain and France. It is on the "watch list" for the Washington Noxious Weed Control Board site (not noxious, but watch). In Georgia EPC it is listed on the list: "Exotic plant that is naturalized in Georgia but generally does not pose a problem in Georgia natural areas or a potentially invasive plant in need of additional information to determine its true status." Invasive plant atlas does not give any details beyond: "It has escaped cultivation and become naturalized in disturbed areas across the southeastern United States and in California. It is drought and heat tolerant and is very common along roadsides and other disturbed areas." Flora of Australia online indicates: "Presumably introduced as a garden ornamental, now commonly naturalised and spreading on the Island," but no indication as to where in Australia this is. In a vegetation classification study in South Africa, V. bonariensis formed a community with up to 60% cover with Datura ferox and Argemone subfusiformis (DuPreez and Venter 1990) indicating its ability to form dense communities which restrict natives. Center for Invasive Species and Ecosystem Health, University of Georgia (0). Georgia Exotic Pest Plant Council List of Non-native Invasive Plants in Georgia. Australian National Botanic Gardens (0). Flora of Australia Online. DuPreez, P. J., & Venter H. J. T. (1990). The Phytosociology of the Woody Vegetation in the Southern Part of the Vredefort Orange Free State South Africa Dome Area Part I. Communities. South African Journal of Botany. 56, 631–636. In Murray and Phillips 2008, in the context of Australian weeds, it is listed as a "non-invasive" exotic species, ("classified as invasive across Australia (category ‘5A’ species). We used this source of information in conjunction with PIER (2009) to identify the invasive species in our dataset."). 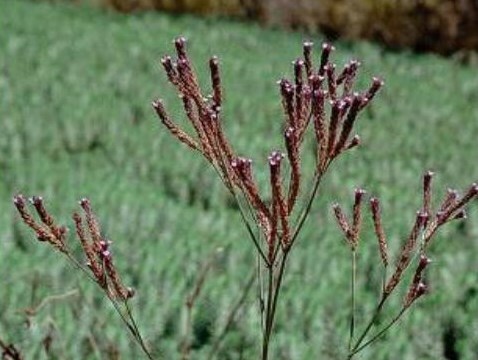 According to Queensland Biosecurity site: "Purpletop (Verbena bonariensis) is regarded as an environmental weed in Victoria, New South Wales, Queensland, Tasmania and the ACT." Note this is not a "significant" environmental weed. In the Syndney area, V. bonariensis was found to be one of the most abundant exotic species which germinated after fire (Thomson and Leishman 2005) and in South Africa V. bonariensis formed a community with up to 60% cover with Datura ferox and Argemone subfusiformis (DuPreez and Venter 1990) indicating its ability to form dense communities which restrict natives. In Australia and South Africa there are areas which match California's climate so this question is marked Yes with low confidence. Thomson, V. P., & Leishman M. R. (2005). Post-fire vegetation dynamics in nutrient-enriched and non-enriched sclerophyll woodland. Austral Ecology. 30, 250–260. Australian biosecurity site: "The purpletops (Verbena incompta and Verbena bonariensis) are regarded as environmental weeds in Victoria, New South Wales, Queensland, Tasmania and the ACT." Note they are not "significant environmental weeds." In Invasive Plant Atlas, several species, including V. littoralis, V. brasiliensis, V. montevidensis and this species are "invasive," there was no information about any noxious status or environmental harm found for Verbena species in similar climate areas. The areas that match California's climate: distribution in South Africa and Tanzania (see very small match area in that area, without a large scale zoom map), some areas in Spain and France, areas in California, areas in New South Wales and Victoria, Australia, and areas along the Chile/Argentinian border. However, in Europe over half of the occurrences extend well beyond the climate match, into northern France and Germany, as well as Scandanavia and the U.K. In Australia, over half of the occurrences stretch inland beyond the climate-match, into inland NSW and Queensland. In New Zealand, none of the occurrence points match California's climate (it should be noted that in none of the species I have assessed have they matched in New Zealand) as well as most of the occurrences in Japan, South America, and the Eastern USA. Very little information about competition and community ecology for this plant available. One paper discussing butterfly distribution (Pryke and Samways 2004) lists: "In the least disturbed sites, both inside and outside the estate, indigenous flowers and Verbena bonariensis dominated." Pryke, S. R., & Samways M. J. (2003). Quality of remnant indigenous grassland linkages for adult butterflies (Lepidoptera) in an afforested African landscape. Biodiversity & Conservation. 12, 1985–2004. Unlikely considering habit, herbaceous perennial with sparse stems. Palatable to cattle. No other information about toxicity or health risk found. Herbaceous perennial, no note or evidence given of thickets or impedance of movement of animals. Murray and Phillips 2009 listed vegetative spread for this species. Also stated indirectly in Qld Biosecurity site: "Purpletop (Verbena bonariensis) reproduces mainly by seed" (emphasis on "mainly). Murray, B. R., & Phillips M. L. (2009). Investment in seed dispersal structures is linked to invasiveness in exotic plant species of south-eastern Australia. Biological Invasions. 12, 2265–2275. Other species of verbena spread via rhizome, but based on lack of evidence, answering "no" to this question. Clemson University Cooperative Extension Service (0). Clemson Cooperative Extension Home & Garden Information Center. In the botanical description in Jepson, the plant produces 8-17 spikes per plant, which appear that they could each produce at least 125 (1-1.25mm) fruits within the "dense" cyme. As well, an informal count of flowers on the plant resulted in a count of between 200 and 420 flowers per cluster, and with >5 per plant, this results in >1000 seeds per plant. Missouri Botanical Garden gives information regarding sowing that implies no unusual conditions necessary. Missouri Botanical Garden (2015). Missouri Botanical Garden. V. incompta documented as producing seed in the first year. In Thomson and Leishman (2005) V. bonariensis is listed as one of the top species growing from seed after a fire. Verloove, FILIP. (2011). Verbena incompta (Verbenaceae), an overlooked xenophyte in Europe. Willdenowia. 41, 43–49. Queensland biosecurity notes flowering from early spring-fall (October-March in Australia). Much > 3 months. Calflora lists flowering in May and June. Invasive Plant Atlas (US) indicates flowering "all summer until the first frost. Missouri Botanical Garden bloom time "June-frost." Queensland biosecurity lists dispersal by animals (animals, "external"), as well as wind and water. Queensland biosecurity lists dispersal by wind and water, but does not indicate its frequency. Listed by Queensland Government as "may also be spread in contaminated agricultural produce" but that doesn't give an estimate of frequency. Note: Calflora/TJM2 lists "Verbena incompta" as a synonym for this species. Tropicos does not. Invasive.org lists V. incompta as "Brazilian vervain" and different than V. bonariensis. Review of taxonomy in Verloove 2010 and Nesom 2011 indicates this is still being debated, but here we go with the synonymy in GRIN, bonariensis = incompta. Reviewed by Tim Hyland and Denise Knapp.